Kids using spa or hot tubs requires special considerations. Optimizing the water chemistry and improving spa and water safety!!! A ColorQ, All-Digital Tester can perform all of the common pool and spa water tests and eliminates the color-matching and guesswork. The Shock-Guard 24/7 ™ Volt Detector and Alarm System warns of electrical hazards and creates peace of mind and a safer aquatic environment, while monitoring the pool or spa water, for the presence of electricity, 24 hours a day. If as little as 1.7 volts of is detected, in the pool or spa water, it sounds a warning alarm, using its built-in buzzer. cFloat is an advanced Pool and Outdoor/Indoor Monitor System that collects key information from pools and the surrounding environment, to provide real-time updates on a variety of pool and environmental parameters. Data is stored in the cloud and accessible on a smartphone, tablet, laptop or smartwatch. Most spas use some sort of chlorine. 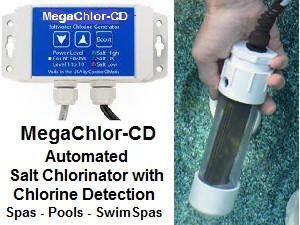 A salt chlorine generator is definitely a better way to do chlorine, in any type of pool. Salt chlorine generators are highly automated and give you better control. The salt level is about that found in human tears. 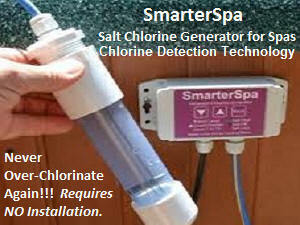 No installation salt chlorine generators are available, for spas and swim spas. Adding a Solar UV Sanitizer, with BioPhotonX™ UV Light Conversion Technology captures and magnifies ultraviolet light, breaking down a portion of the water molecules and creating Free Radicals. These active Free Radicals attack, weaken and inhibit reproduction of algae and bacteria, allowing you to use less chlorine and fewer chemicals. Needs no installation. Suitable for all types of residential pools, swim spas and spas, up to 15,000 gallons. How to help make your spa or swim spa kid friendlier? Apart from the obvious water safety factors, consideration should be given to sanitizer choices, water temperature and length of bathing time. Kids tend to spend a lot of time in the water and, ultimately, depend on the adults for the important matters of pool safety and water quality. If problems arise, refer to the Spa Problems Page, as a source of problem-solving information, broken down into various categories. Scroll down the page and click on the linked keywords, catch phrases or images, in the archived answers below, to access additional information, on that topic or product. We would like to allow our small child to go into our spa with us at a temperature around 89-92°F degrees. I have been told the best alternatives to using straight chemicals are a Mineral Purifier then a non-chlorine shock at exit. Do you have any opinion. Thank you. Mineral Sanitizers are products that sanitize by using metallic ions, such as silver, copper and zinc. Just using a mineral sanitizer is not enough. To maintain proper spa water quality, you need to use an oxidization, as well. That is the purpose of the non-chlorine shock. So long as the product choice includes both capabilities, I see no problem. However, my own preference would be to use a salt chlorine generator, as it is a complete sanitizer and is the better way to utilize chlorine. We offer several models, that require no installation and two of them are "smart-enough", to only produce chlorine, when it is actually needed. They help assure that you'll never overchlorinate again. Maintaining a proper free chlorine level, will be as easy a setting the output dial. I hope that this information proves helpful. ► Spa Use By A Child? My two year old daughter loves to get in the hot tub with my husband. I do not like it because he keeps it @ 105 degrees. It does not seem to bother her at all. She says "I love it." He is very careful not to let her stay in more than just a couple of minutes at a time. Should I worry about these brief moments with dad? Is it OK to let her stay longer if she wants to, and she does. Thanks. I share your concern. Firstly, 105°F is above the recommended maximum of 104°F. Spa bathing recommendations are not written with a 2 year old in mind. Given the low body weight, the spa water can cause a fairly rapid rise in body temperature. Short bathing times, with less than full body immersion are probably a necessity. In any event, I suggest that you discuss this with a pediatrician, inasmuch as I am not really qualified to take part in this decision. A child's skin is more likely to be sensitive to the water chemistry and sanitizing. Make sure that you keep tabs on both, before each use. Using a ColorQ Digital Water Analyzer will give you reliable results, without any color-matching or guesswork. Enjoy the spa. I just purchased my first home it has a pool and a spa. I let the pool guy take care of his end but I manage the spa levels. When I moved in the spa was full, with a Bromine Floater. I tested the water several times with a kit that was here when I moved in, 5 drops of yellow stuff, 5 drops of red stuff you know the kit. I always got very high bromine levels. Not sure if I was testing correctly I took a water sample to my local pool/spa supply "expert". I was advised by the "expert" to drain the spa and switch to chlorine, which I did. Now I filled the tub added the metal gone and then later the granulated chlorine. Tested the levels about 3 hours later and WAY too much chlorine. Took a sample to the "expert" and was advised to let the chlorine stabilize for a couple of days before adding any "spa-up or spa-down". Two days later I tested the water, pH normal, Chlorine, does not register. The chlorine side is as clear as the original sample. Like I never added the yellow stuff. Well I am not stupid. No yellow in the cylinder means MORE chlorine. Added more chlorine. Tested 2 hours later, the test results were way to much chlorine. Waited 2 days with no use of the spa and tested again. NO CHLORINE! But the pH is almost ideal. How often should I need to add chlorine to a spa that is set to 103°F But is only used once or twice a week? The spa is always covered and has minimal use. Should I ignore the local expert and switch back to the Bromine floater, or do I need to adjust my spa levels on a daily basis even though I use it on a bi-daily basis? One more question before I end this log winded, very confusing e-mail. I have a nine year old daughter who wants to enjoy the spa with me. I have been told by friends that have spa's that 103°F is too hot for someone her age. Is this correct? If so what is an ideal temperature for a child her age? Thanks for any help, Cold and confused. If your pool and spa are separate and do not share common water supplies, I would prefer the use of bromine. It has less odor and allows for easier addition. There is nothing Houdini-like happening! The chlorine or bromine levels drop, if there is organic wastes present, such as after bathing. The test kit that you are using will suffice for bromine use, but it provides inadequate information, when chlorine is being used. I would prefer using an all- digital ColorQ Tester, which eliminates color-matching and guesswork. You should test the water at least several times weekly, even if it is not being used. You don't want the sanitizer level to bottom-out, as it will made catch-up more difficult. If you use the floater with bromine, all you should require is pH increaser and, perhaps, a dose of shock after each use of the spa. If you would like assure even better water quality with less work and fewer chemicals, consider adding an ozone generator. This will allow the bromine to function in a back-up role and will reduce the chemical sensation. The body mass of your 9-year old daughter is far less than that of an adult. Immersion in 103°F water will cause the temperature of her internal organs to rise more quickly, than that of an adult. Hence, you should lower the temperature, reduce the bathing time and the extent of immersion or all of the preceding. In any case, I would defer to the good judgment of the family doctor or pediatrician. I hope that the information proves helpful. Enjoy the holidays.